Personalise your own faux leather photo album from bonusprint. Give your wedding photo book a leather-bound look, and keep your favourite family snaps safe in a durable and stylish cover. Here’s how to create and buy your own faux leather photo album. A personalised faux leather photo book adds a little luxury to wedding photos and a professional finish to a portfolio. Our hard-wearing fabric is ideal for protecting your snaps, and the chic faux leather finish looks great on any bookcase. You can bind any of our hard cover books in faux leather. Maybe choose a large faux leather photo album for shots of your special day, or start a photo library with a series of medium-sized books. And just like with all of our photo book options, you can customise the contents any way you like. To get started, head to our creator tool. You’ll see our full range of photo books, which you can filter by size and format. You can’t bind our spiral book or soft cover albums in faux leather, so select the style of hard cover book you want to customise. You’ll then get to choose whether you want a photo cover. Click ‘no thanks’ if you want faux leather, then start customising the layout of your photo book. Upload all the images you love, and be creative with clip art, frames and more to get the look you want. When you’ve added all of your favourite moments to your book, click ‘add to basket’. Here, you can choose between a linen or faux leather cover. 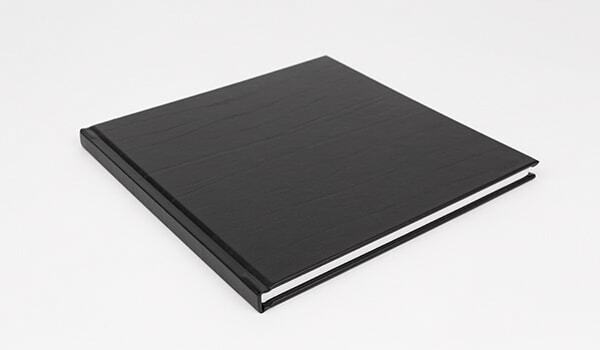 No matter what size or style of book you’ve customised, you can bind your photo album in faux black leather. But if you’ve picked one of the smaller hard cover books, you can choose from a toffee brown shade too. You can also select gloss paper to bring out all the vibrant colours in your snaps. Then you’re ready to confirm your order, and we’ll deliver your custom faux leather photo book to you.